The Junior feels so comfortable, but there’s still that oddity of the shrunken size that might not appeal to everybody. Tidy build, compact size, feedback resistance, slightly more Gretsch-like voicing, a punkier edge. Just the one colour; the Bigsby needed a little TLC; the shrunken size, as compact as it is, might not appeal to everyone. The G2655TG-P90 Streamliner Center Block Junior is based on an existing model, the 13.375-inch (340mm) wide G2655T Center Block Junior. Gretsch’s product specialist Adam Bowden-Smith reminds us that “the ‘junior’ bit refers to its small body - it doesn’t mean it’s for beginners or anything like that”. 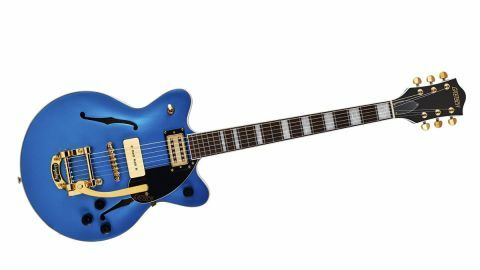 Again, while the standard model sports either the V-Stoptail or a licensed Bigsby B50, the limited-edition model is Bigsby-only, in one satin colour, and here the ‘soapbar’ P-90 sits in bridge position flanked by a Broad’Tron at neck. Incidentally, it’s not the first time Gretsch has added a P-90 in bridge position (that was another limited model but in the Professional Series, the G6115T-LTD15 Center Block Junior ‘Red Betty’). Entry-level it may be but Gretsch’s classic laminated construction, with proper kerfed lining, is replicated here with nice touches, not least the ‘secured’ tune-o-matic bridge, which sits directly into the spruce centre block of the Junior. There’s a vintage style to the simple black knobs and, although the rosewood fingerboard is bound and features a big pearloid block inlay, it doesn’t look over-blinged like some classic Gretsch models. That said, the Junior goes for gold-plated hardware - a first for the otherwise nickel-only Streamliner range - which accounts for the upcharge in price. The Junior weighs in with a depth of just over 46mm and a nut width which measures 24.4mm at the 12th. It has a nicely dialled in setup, though, approximately 1.6mm on both treble and bass sides, and with this style of small fret you certainly get to feel the ’board. The weight is also light, not surprising given the size. The Junior uses Gretsch’s Tone-Pot control circuit and from what we hear we’d guess that the master volume has a treble bleed cap - the sounds remain pretty clear as you pull that down, while the individual volumes remove a little high-end when pulled back, as well as some thickness. The Junior certainly has more high-end than you’d expect. It’s a tight, solidbody voice, but - and this is important - when you’re swapping guitars during a set, as many of us do, things need to sound right without making too many adjustments. And this gets us much more into that camp on bridge and in mix position (especially with a little neck pickup volume roll-off ). The neck humbucker alone, however, certainly has a jazzier thickness, but again it lacks a little clarity full up. We find ourselves pulling the pickup volume back and we’re already imagining a pickup swap - perhaps to a humbucking-sized P-90? But this Junior wants to take us on a different journey with on-the-edge-of-gritty amp tones giving hugely 60s-informed Americana or with some fuzzier gain we drop right into Jack White Street via a garage or two. There’s certainly some trashier, edgier voices here and a lot more feedback resistance, although it’s still easy to coax some musical feedback (which you can manipulate easily with the Bigsby). The Junior feels so comfortable, but there’s still that oddity of the shrunken size that might not appeal to everybody.